MONSTER DRAWINGS and ONLINE COMICS! Took a little time yesterday to make this banner for the weekly webcomics. It shows the four main characters: a Mad Scientist,his two twin surgical assistants and a Superhero who's seen better days ( or maybe it has always been like this?) Intrigued? Check out the comic, new pages every friday. Ink Drawings! Did this weird cyber panel a couple of days ago but was to0 excited to work on this weeks webcomics that I decided to wait until they were both finished before I started posting more art. 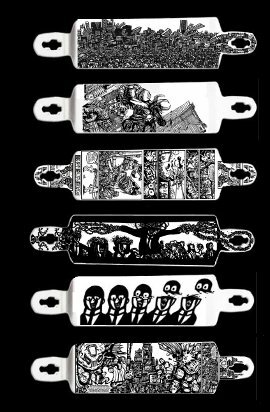 MONSTER DRAWINGS SKATEBOARDS! 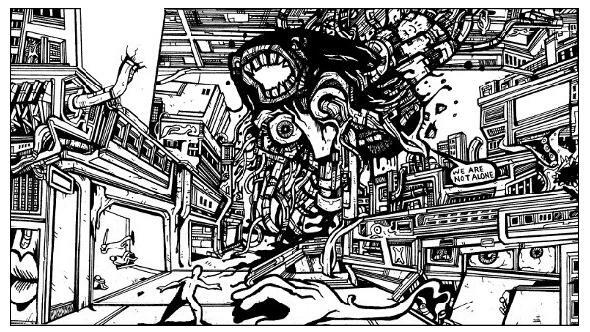 The Monstrous Metropolis, Manga Movie Madness, Surreal Decapitations and Underground Comics! 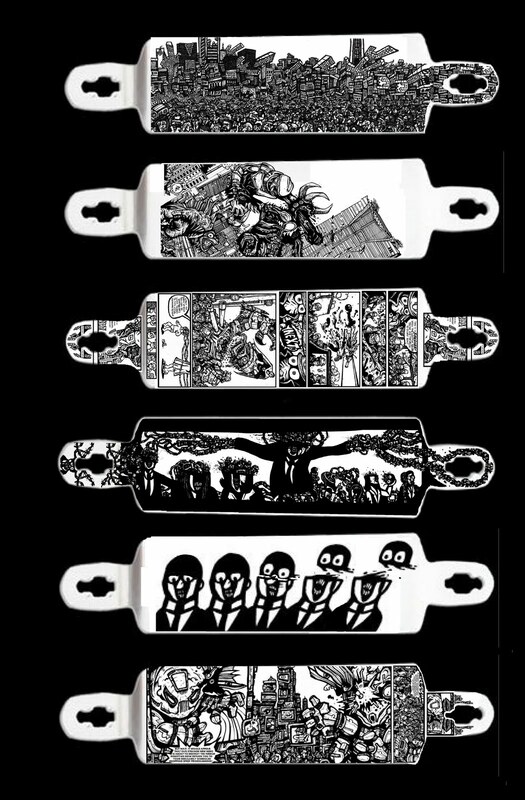 I spent a bit of time this weekend preparing a portfolio of skateboard designs. I’ve been doing some work with the Longboard Living skateboard shop including hand-painted prototypes and limited edition boards as well as a ceiling mural for their new store. While the company is still grassroots, it is growing rapidly and on more than one occasion skate entrepreneur Ryan Rubin has requested a portfolio from me so I thought it’d be wise to have this ready (finally). What I appreciate most about collaborating with Longboard Living and the longboard community is the positive attitude and activist philosophies we both share. The sport is a fun, healthy, and positive social expression that more and more young people are getting involved in.Kensington Skaters gather in greater numbers each week to take part in group tours and what better place for my art than cruising down the roadways with a bunch of crazy kids?! MONSTER DRAWINGS! Just got these 3D graphic test sequences opened after some problems with my file converter. Thanks to the financial support of the Toronto Arts Council I am currently working on a set of "Living Paintings" or animated loops intended for gallery installation. For the "City of Gears" animation I am creating a dyptych expression comparing the the city from a distance and from ground zero. The first part (from afar) features the faceless metropolis overcrowded by anonymous denizens. This film is being rendered in 3D by graphics wizard Laurie Ronne. I'm doing the companion piece, the city populated by all the crazy individuals, using the old fashion hand drawn stop motion techniques. MORE MONSTER ANIMATIONS HERE! MONSTER DRAWINGS ON WEB TV! I did an interview for THAT CHANNEL'S Liquid Lunch with Hugh Reilly and Erin Ademoglu last Friday April 8/2011 (just got the footage today!). It was a fun opportunity to document some of my stories on video. I plan to edit more clips like the one here to put on various pages of this site. You can also check out the whole video on my Fashion Videos page. CRAZY ONLINE MANGA! April 2011 Giant Monster fist fight and creepy pictures from the Cult of the Cat! An emormous cyber-human battles satanic lizard beasts, hyper-intelligent apes from space, and a rampaging 100 ft. Toyko Goth girl with cthulu tentacled fore-arms while a diabolical cult of cat worshippers sacrifice a business man wearing a mouse mask to the ancient almighty Ra. 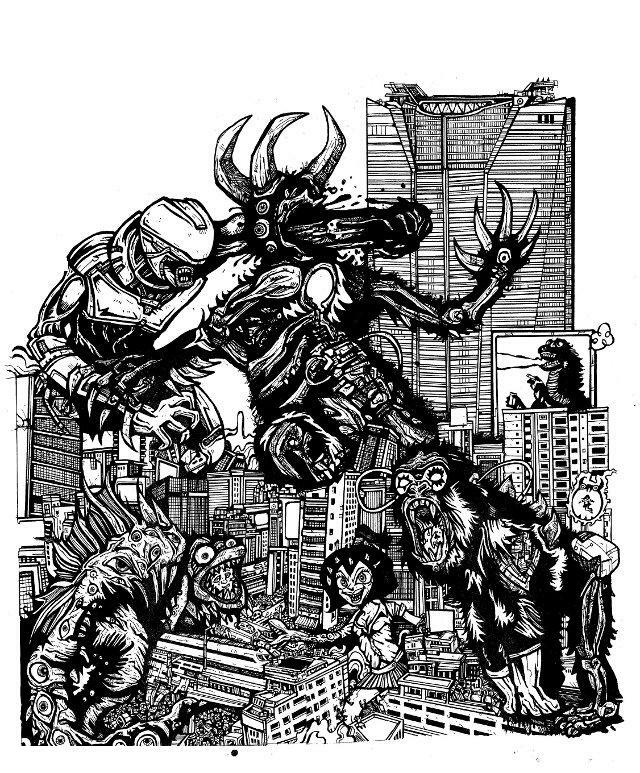 Japanese movie madness mid-life crisis cartooning and manga inspired ink drawings. MORE HERE! CHECK OUT ALL THE HEY APATHY MONSTER DRAWINGS!